We've always wondered if some of the head honchos at ESPN sit in a back room somewhere, with a slug of Scotch and babbling paranoid fantasies to a painting of Tom Mees, railing against those who dare to question its authority. And now we have proof: In an interview with The Big Lead, Mike Freeman, author of the famous ESPN: An Unauthorized History, says that the network really does have an enemies list. And guess what? We're on it! You will also find this interesting regarding ESPN: several high ranking people there that I trust, informed me recently the network has composed an 'enemies' list. An actual list known only to a few high ranking people. The people on the list are banned from appearing on the television side. If this is true, it is very Nixonian stuff. What's next, wiretaps? I have the names of some of the banned people provided to me by my sources and it is pretty amusing. Let's put it this way: If I were the guy who runs Deadspin.com or Jason Whitlock, I'd hire an official food taster. Or borrow some body armor. OK, friends, honestly, we've never been more honored in our lives. 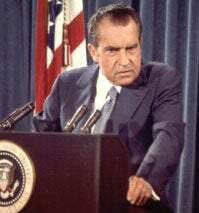 They really ARE Nixon! We can see it now, a couple of years from now, with Norby (Norby!) Williamson stepping to the mike: "I can see clearly now ... that I was wrong in not acting more decisively and more forthrightly in dealing with ReynoldsGate."